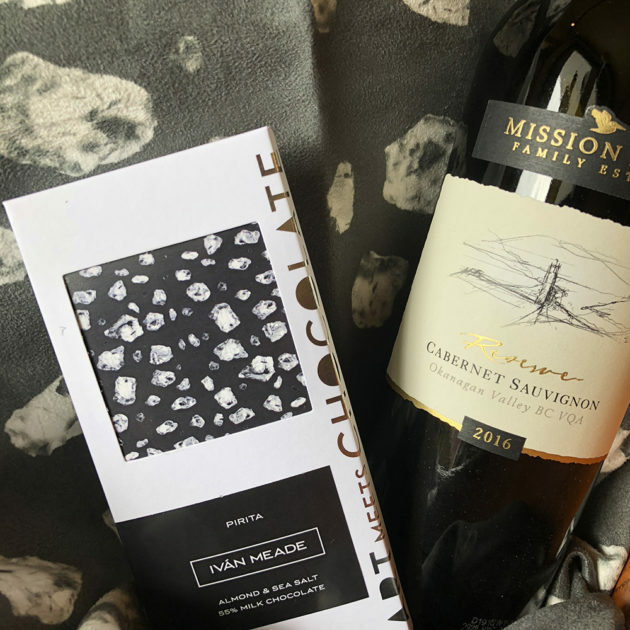 One of the most quintessential and inspiring pairings your palette can enjoy is a piece of chocolate and an accompanying glass of wine, an even better when you can do this while supporting our local Art Gallery of Greater Victoria. 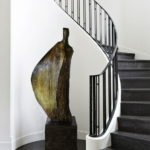 A pairing without a precedents – Iván Meade Chocolates, Mission Hill Wines and the Art Gallery of Greater Victoria – Please join us in the Massey Sales Gallery on October 4th for an Artist Talk featuring filmmaker Jill Sharpe, painter Michelle Miller, and sculptor Sandy Voldeng. 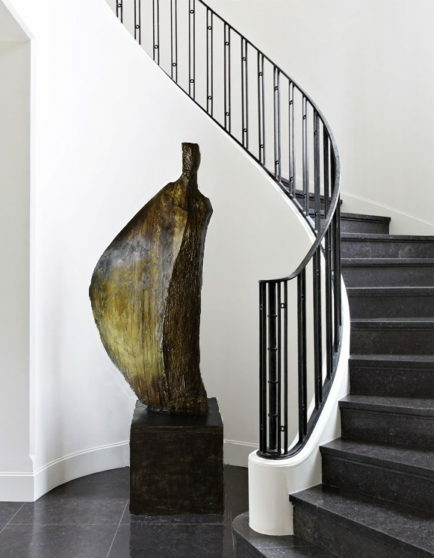 Figuratively Speaking: Artist Talk & Evening Opening. 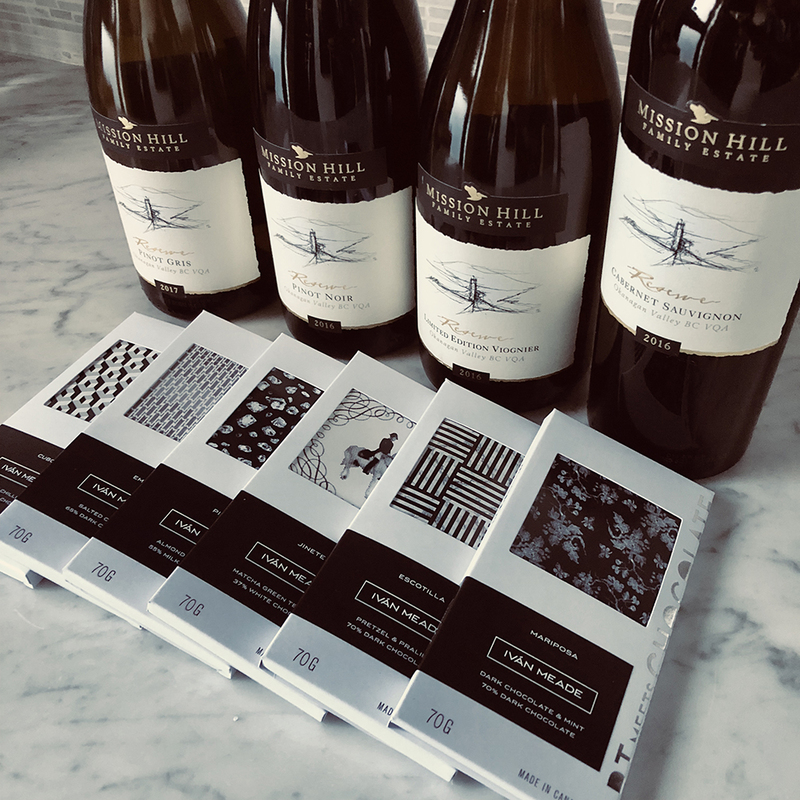 The evening will include a short talk by each artist and a screening of the film Bone Wind Fire and to taste our delicious line of chocolate which we will be paring with Mission Hill Wine! 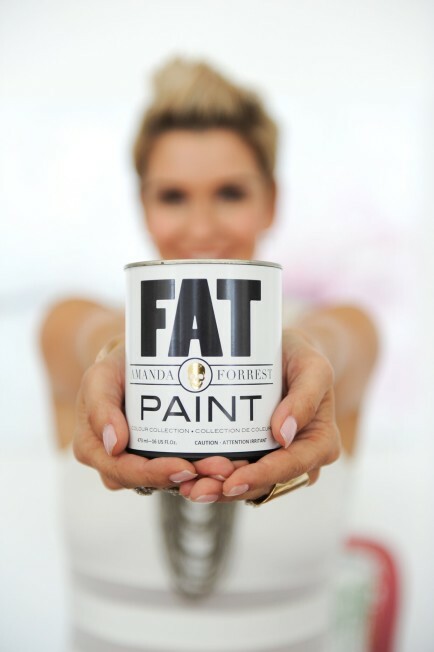 – An event you can’t miss! In 2017, I expanded my personal narrative in design with the introduction of a line of chocolates, translating our textile collection onto the palette to delight all the senses. The premium chocolate collection is the combination of two of my passions: great design and quality food. 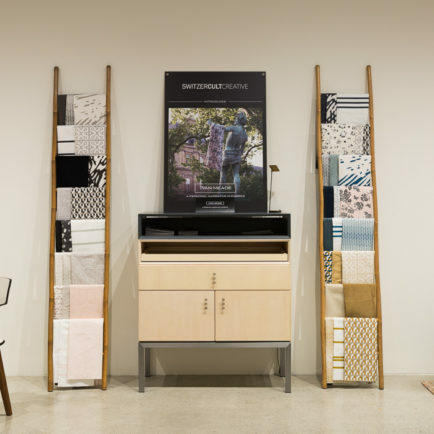 As a unique touch, each flavour is a representation of a fabric from our thriving eponymous fabric line. For more than three decades, Mission Hill’s commitment to and passion for creating exceptional wine has never wavered. 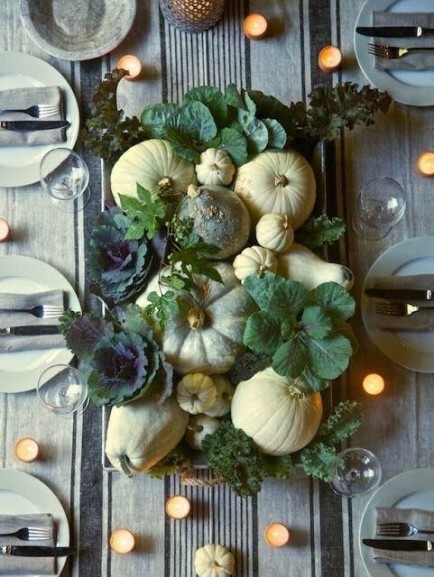 Each wine is an expression of sustainable farming and precision viticulture in their estate vineyards and winery. Hand-selected grapes, extreme viticulture management, longer barrel time, and more lees stirring all contribute to the exceptional Reserve wines. If you are local and want to try these amazing wine selections, they are available at Artisan Wine Shop – 644 Broughton Street in Victoria, British Columbia. 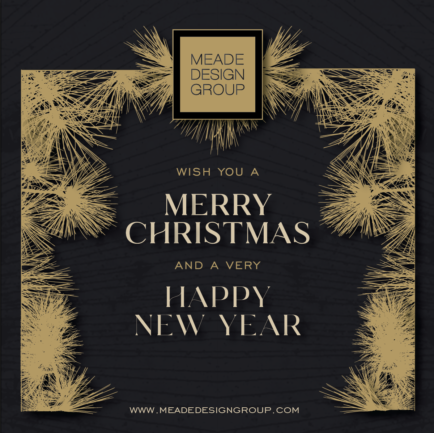 Art is all about interpretation – at first glance Eme was designed to be geometric with a subtle ombre chevron as a secondary pattern, but in looking to it for flavour inspiration – it could be argued that it is reminiscent of drizzled caramel. This is a classic and nearly perfect flavour combination between Old World style and New World finesse. Ripe raspberry and Rainer cherry on the nose evolve into complex flavours of spice, wild strawberries, and black cherry. A subtle hint of French Oak in the wine reflects nine months of barrel aging, playing up the caramel notes of the chocolate. A truly classic pairing that is here to say! With it’s elegant subject, creamy background and dainty flourishes, our Jinete Dominican Republic white chocolate is the perfect pairing for this light, tea infused wine with its hint of lime. 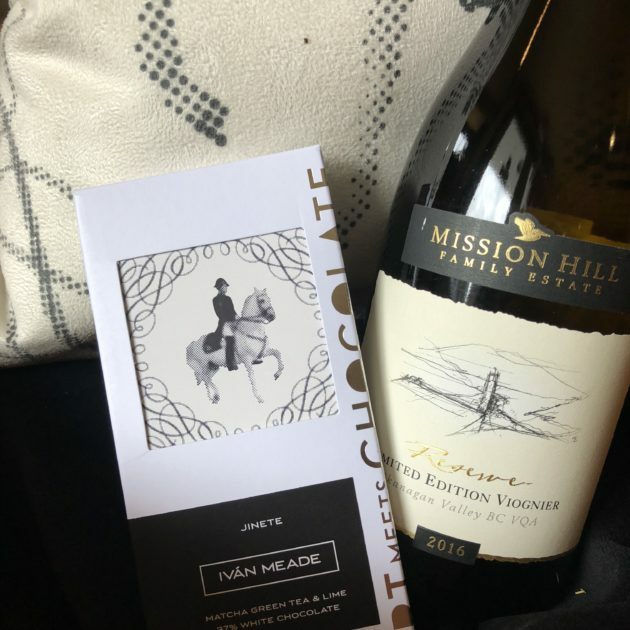 Once you pair the Iván Meade – Jinete chocolate with a Limited Edition Viognier wine from Mission Hill, a magical moment happens as the chocolate enhances the vibrant flavour and intensity of the wine in a very unexpected way, manifesting notes of apricot and peach fruit. 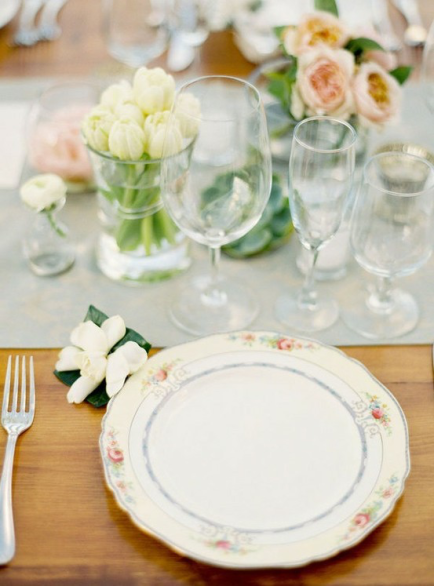 A sophisticated an totally unexpected mix that will be the talk of the night! A bold pattern for a bold flavour. The crisp geometric motif of Cubo is inspired by the geometric work of Vasarely. If the Mayans that celebrated with the mix of chili and chocolate were here today, they would be celebrating a whole new marriage of flavours between this wine and chocolate. 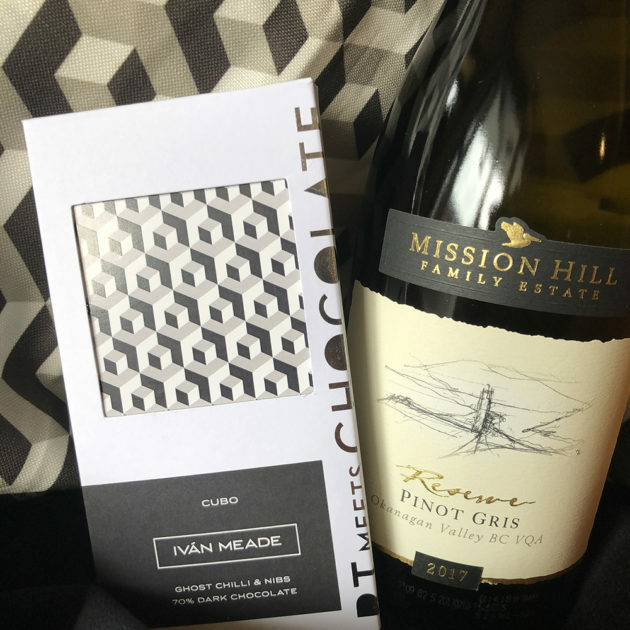 The spiciness of our Cubo chocolate matches incredibly well with the Pinot Gris Reserve by Mission Hill. With hints of freshly sliced ginger, Anjou pear, nutmeg, and flavours of white peach, grapefruit, and zesty lime, a round palette develops out of this full-bodied and aromatic wine when combined with the spiciness of the Ghost Chilli and cocoa nibs chocolate bar. The visual connections between this pattern inspired by silver nuggets and the rough texture of almonds and sea salt isn’t subtle, but it is delicious! 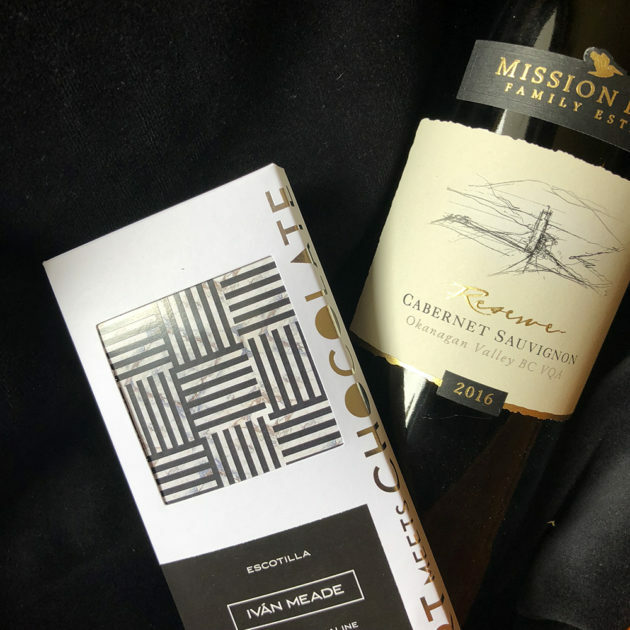 The real silver lining is in the phenomenal pairing between Pirita (almond and sea salt 65% milk chocolate) and Mission Hill’s Cabernet Sauvignon. A full-bodied wine with rich, black fruit, spices, hints of cedar, and a long and complex finish compliments the delicacy of Pirita’s milk chocolate perfectly. 16 months of barrel aging rounds out this sophisticated wine. A pairing made in heaven!!! A tribute, Mariposa is inspired by some of Ivan’s mothers’ favourite things. It seems only natural for Ivan’s mother to inspire the flavour as well – her favourite flavours were always dark chocolate and mint. 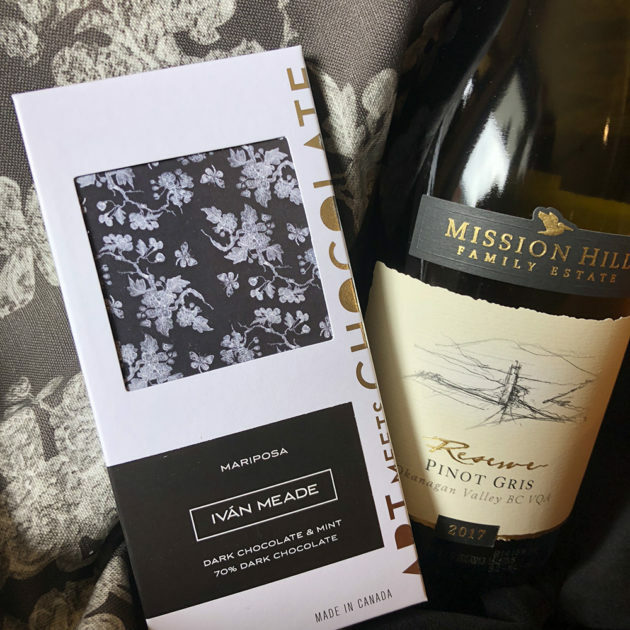 This rich 70% dark chocolate pairs beautifully with the Pinot Gris Reserve by Mission Hill, a wine with a fine balance of warmth and freshness. The mint is a natural link between this sophisticated Pinot Gris by Mission Hill, with its notes of freshly sliced ginger, anjou pear, and nutmeg. Combined, these two accomplices create a fruity and herbal match worthy of the gods. While Escotilla’s pattern is inspired by tile work, visually the linear motif represents pretzel sticks and the marbleized colour combination of taupes, white and blue are indicative of the warm nutty flavour of pralines and crispy sea salt. 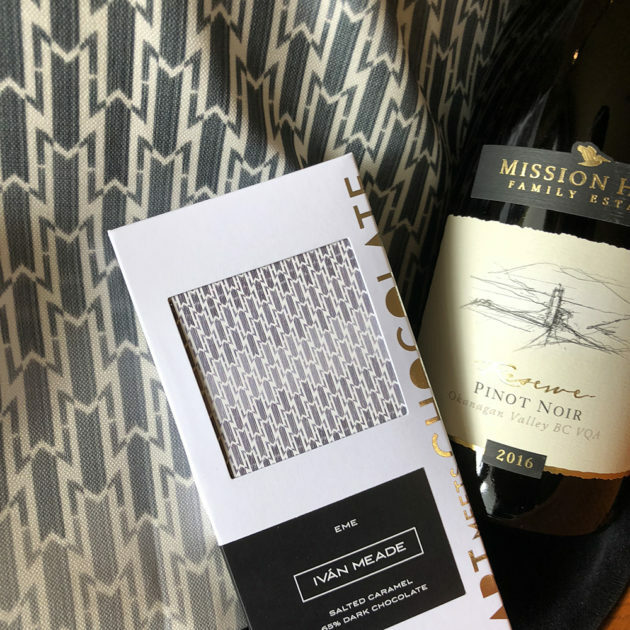 For this pairing, we fell in love with the full-bodied Cabernet Sauvignon by Mission Hill, with its rich, black fruit, spice and hints of cedar. 16 months of barrel aging rounds out this sophisticated wine. A pairing that will wake up all your senses!! !